← I’ll Get You My Pretty, and All Your Crumbs Too! Strawberry cake mission ACCOMPLISHED! 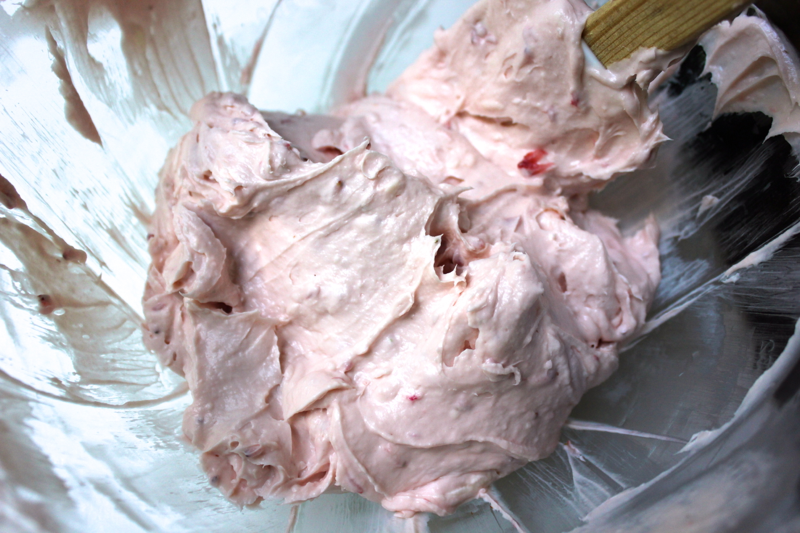 Last summer, I set out to make a strawberry cake with strawberry cream cheese icing. Although the icing was a huge success, the cake was a gluey flop. These cupcakes are the complete opposite! They are light and fluffy, with a delicate crumb. They are flavorful and perfectly moist, and one bite reveals the tasty strawberry gems tucked inside. Topped with my all-time favorite frosting, these cupcakes are a joyful indulgence that have the power to brighten any day. To make them, start by bringing 1.5 sticks of butter and 1 brick of cream cheese to room temperature. 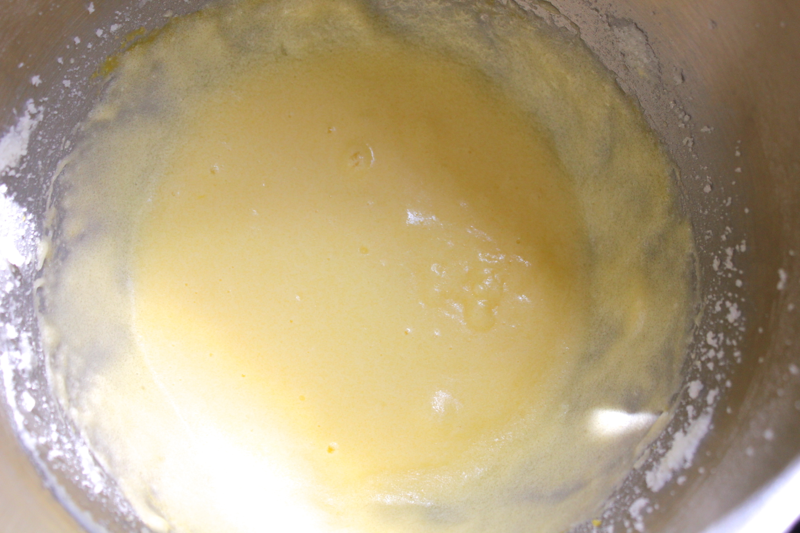 With a mixer, cream together 1/2 stick of butter and 1 cup of granulated sugar. One at a time, crack in 2 eggs, making sure to completely combine each. Mix in 1/3 cup of Greek yogurt (I used non-fat), 1/4 cup of vegetable oil, and 1 tablespoon of vanilla extract. While mixing, gradually add in 1 and 3/4 cups of cake flour, 1.5 teaspoons of baking powder, 1/2 teaspoon of baking soda, 1/2 teaspoon of salt, and 2/3 cup of milk (I used non-fat). 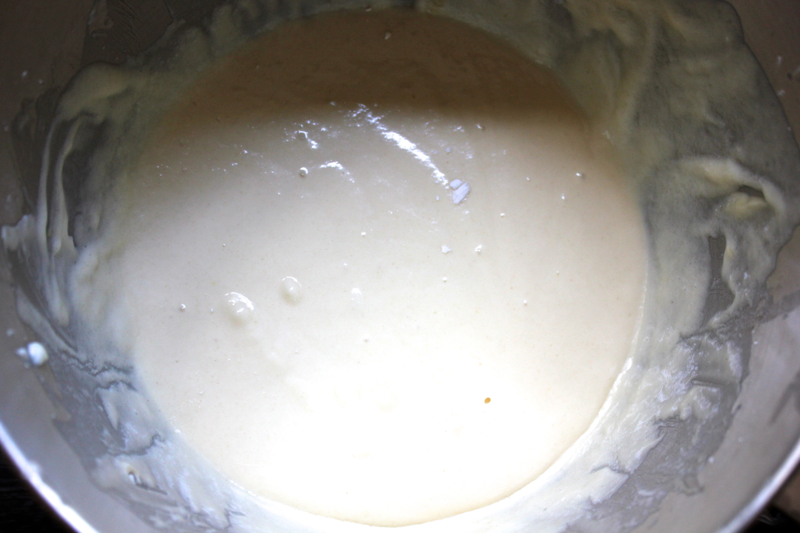 Continue mixing until the batter is smooth. 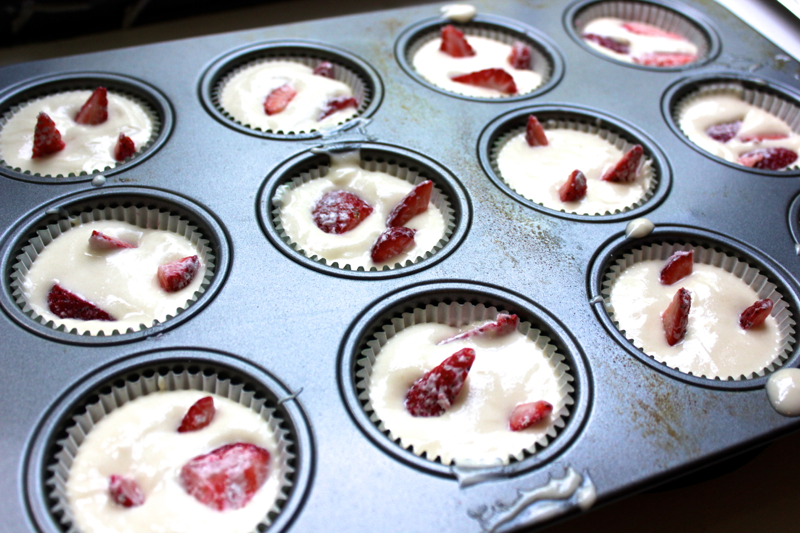 Preheat your oven to 350º F.
Then, prepare the strawberry gems. Remove the hulls from about 6 strawberries. Slice the strawberries lengthwise into quarters. 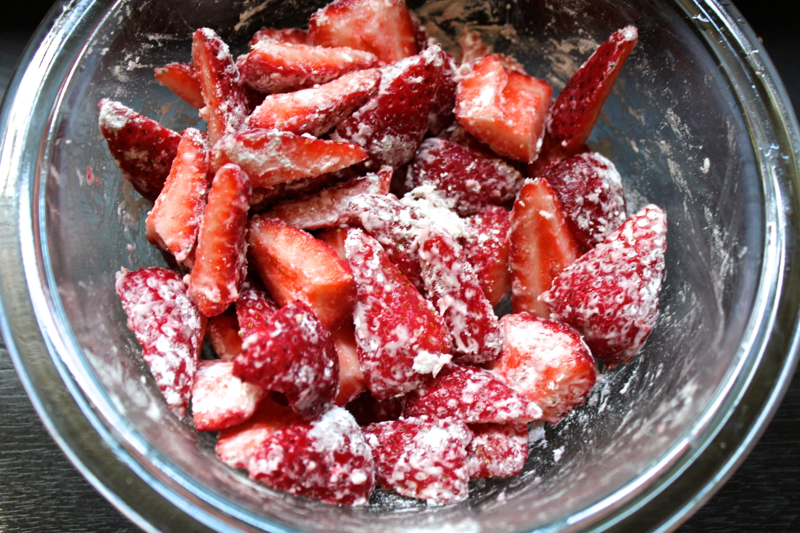 Pat the strawberries dry, and then toss them with a little bit of cake flour. 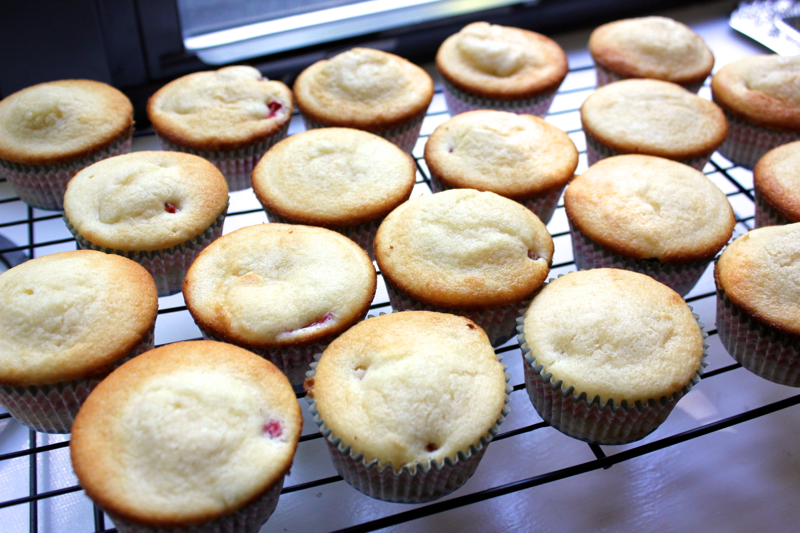 This step will prevent the strawberries from oozing into the cupcakes. Line a muffin tin with cupcake wrappers, and fill them 2/3 of the way full with the batter. You should get approximately 17 cupcakes. Stick 3 strawberry spears vertically in each cupcake. The vertical placement makes it easier to eat the cupcakes later so you don’t have to bite through horizontal strawberries. Bake the cupcakes for 14 minutes, rotating the pan around half way through for even cooking. Once the cupcakes have cooled slightly, pop them out of the tin and let them hang out on a rack while you prepare the frosting. 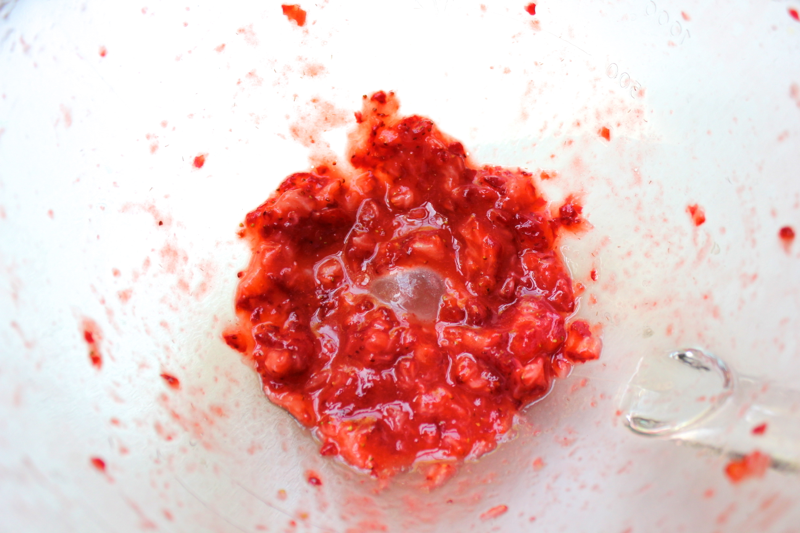 Chop up 4 strawberries and beat them with a mixer until they are very runny. 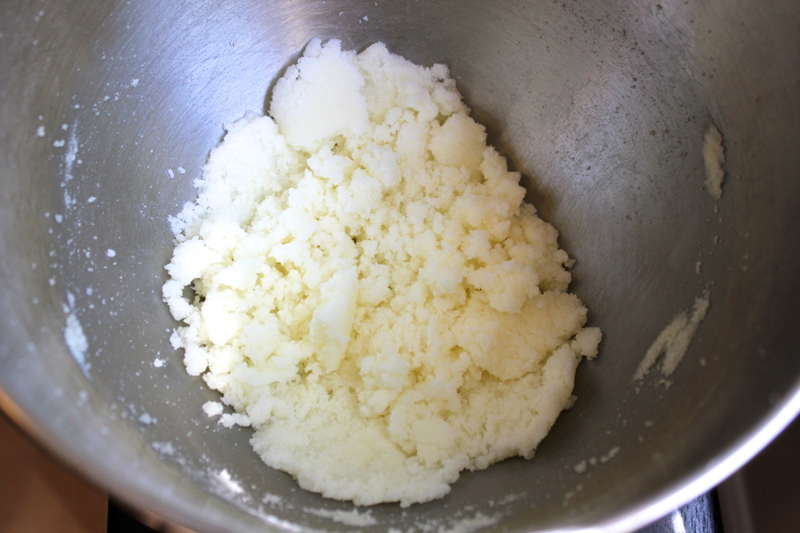 Add the brick of room-temperature cream cheese and butter to the mixing bowl, and beat them until they are fully combined and slightly fluffy. Add in 1 teaspoon of vanilla extract and 1/3 cup of powdered sugar, or more to taste, and mix well. Seriously, try not to eat all of the frosting before it gets onto the cupcakes. It is very tempting!! 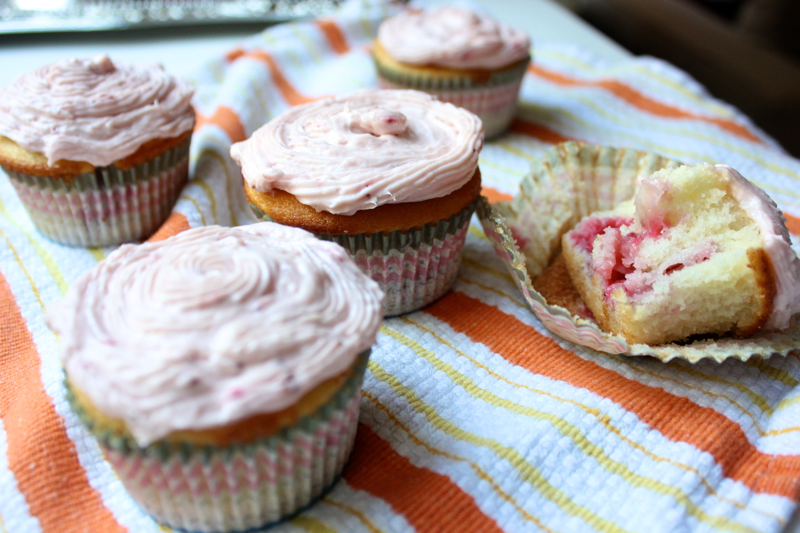 When the cupcakes have fully cooled, ice them with the strawberry cream cheese frosting. You can use an offset spatula to spread the frosting or a pastry bag to pipe it. I prefer eating these cupcakes slightly chilled because the icing takes on a firmer consistency. 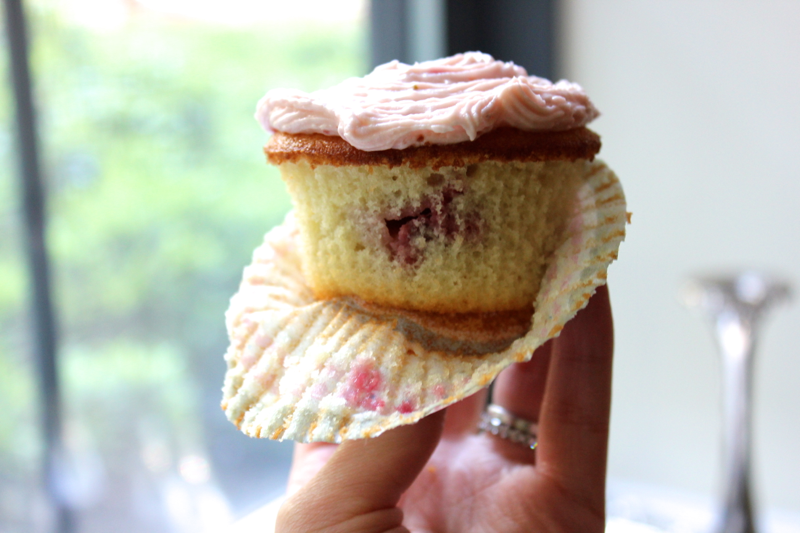 Unwrap the cupcake, and admire the strawberries shining through the cake’s exterior. 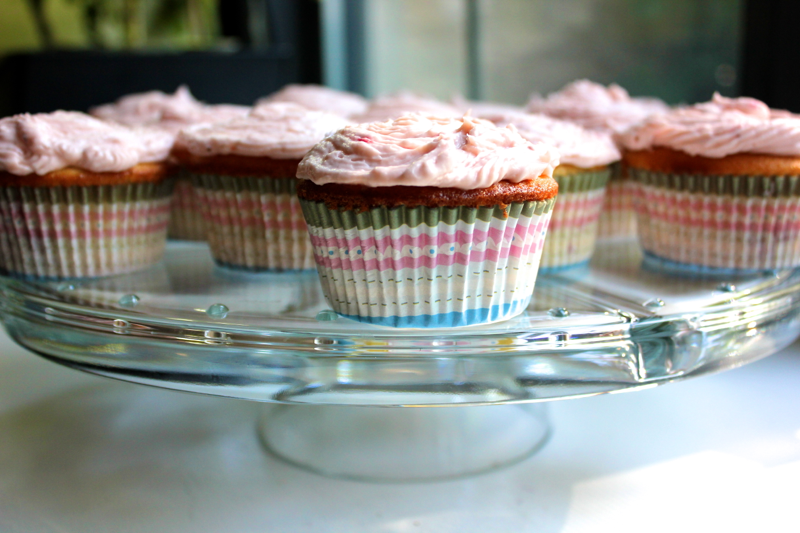 The cupcake recipe is adapted from the Pastry Affair. I waited many months for strawberries to come back in season before retesting this recipe. My patience paid off! Oh my Witty!! Yum, these look delicious!! I think my girls would LOVE to make them!! I love the strawberry gem technique – very clever, good tips!! Thank you!! I hope you enjoy them. I’m already craving a second batch!